Consider this situation: A 68 year old wheelchair-bound man with moderate to severe dementia is being assisted with shaving by a well-meaning dedicated CNA. He is very restraint, seems to be increasingly confused and, as the CNA continues to attempt to help, he becomes physically agitated. The CNA reports to the nursing director that he became unruly and it is charted that he is combative. Interventions are put in to place to protect the caregivers. This seems like the right course of action, right? Now, consider this: The man began shaving at the age of 15. 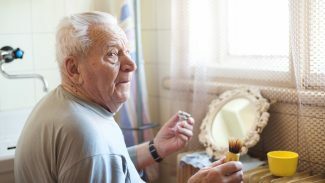 For 53 years, he shaved every single morning, without fail – in the shower! He never shaved while sitting in a chair in the middle of his bedroom while looking in a mirror on a tray table. This was not ‘how he did it’. Unwittingly, the CNA was attempting to have him learn a new behavior rather than tap into residual behavior. It was an un-winnable situation for both the man, and the CNA. Finally, consider this: If the CNA has been able to look in the man’s file, found a questionnaire that he had filled out prior to beginning decline, that spelled out how he ‘did things’ in his daily life – that spelled out that he always began his day with a shower, that he drank his morning coffee before starting his breakfast, that he liked to fold his socks down and that he always got out of bed on the right side, AND that he always shaved in the shower. If this questionnaire had been available, the CNA would have been able to use that information to create a schedule of ADLs that fit in to this man’s understanding and residual behavior. The CNA would have had the opportunity to create a winnable situation for everyone. This questionnaire allows the person to record every aspect of their daily routine from the order of self-care routines whether or not they like their peas smashed into their mashed potatoes. It records the person’s occupation which may give future caregivers clues on how to connect and records favorite activities that can be used to develop therapy techniques that will work best. The answers on this questionnaire can be used to assist with therapy and nursing for a person suffering from dementia, stroke or any other cognitive disorder. It can also help with assisting in the recovery of TBI, head trauma, brain surgery and a plethora of other conditions that affect the person’s cognitive abilities. A person should fill out this questionnaire and keep it with their personal papers. They may want to update it every few years. In the event an illness or accident requires nursing or therapeutic interventions, the answers on this questionnaire may make the difference between a clean-shaven happy day, or the label as a combative rebel.